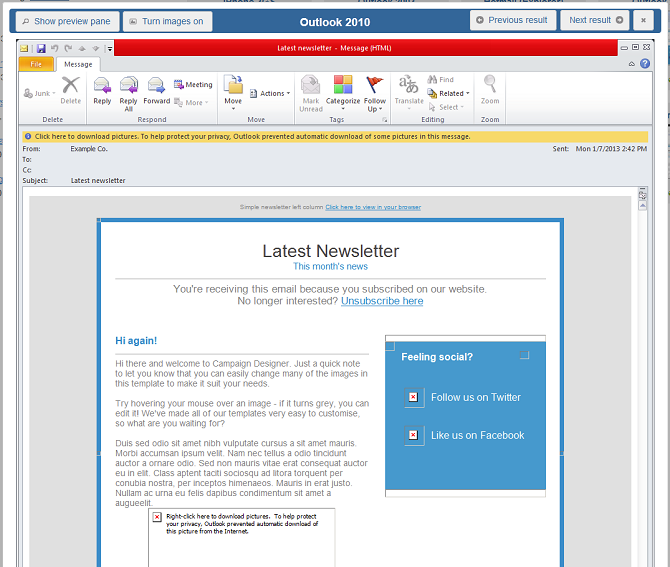 Using our Inbox Testing feature you can ensure your email looks its very best in the most popular email clients without even leaving your account. It's a great way of spotting any potential errors before sending your email and feeling confident that subscribers will see your email as you intend. You'll need to purchase some Inbox Testing credits to use this feature. These credits are different to the pay-as-you-go credits for sending your campaigns to subscribers. Each test costs 1 credit to see the campaign in all email clients. You can purchase Inbox Testing credits on the 'Buy and upgrade' page under the cog icon. 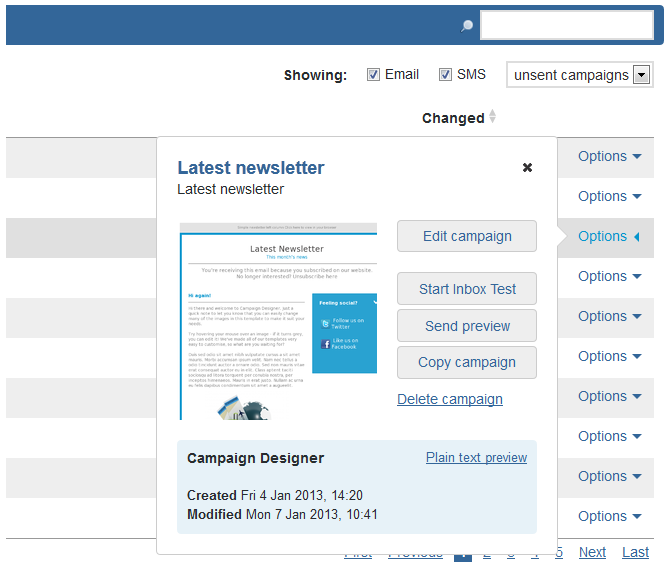 To run an Inbox Test, first head over to 'Campaigns' under the Create tab in your account. If you have edited and saved the campaign in the last 30 minutes, you can start an Inbox Test by clicking on the orange banner at the top of the page. Alternatively, click the 'Options' link next to the name of your campaign. This will open the options popup box with details of your email. 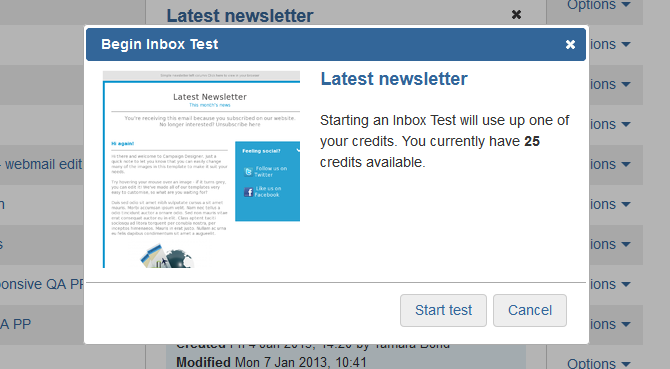 To start your test, click 'Start Inbox Test'. A small box will now appear asking you to confirm the test. Click 'Start test' to begin. Next you'll see a page where the test results are generated and after a couple of minutes will appear. The results can take a few minutes to generate. You can come back and check on your results at any time by clicking on 'Inbox Testing' under the Create tab. To the left of the page you can see previously run tests and delete tests by hovering over them and clicking the bin icon. There's also a reminder of how many testing credits you have left. 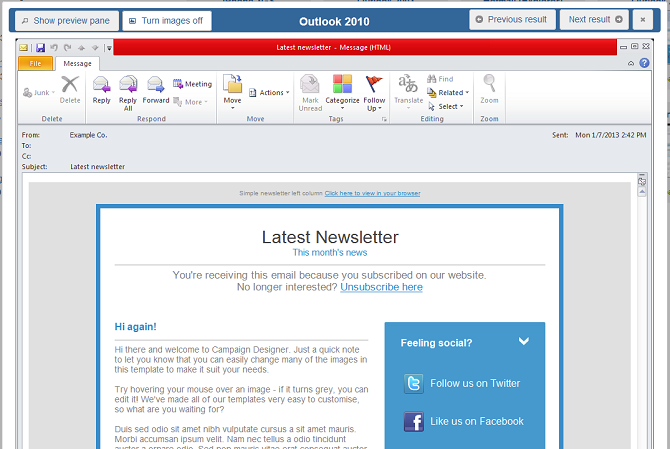 Each grey box on this page shows a thumbnail of the campaign in the email client your campaign has been tested in. You can view your email in full size by clicking the box. 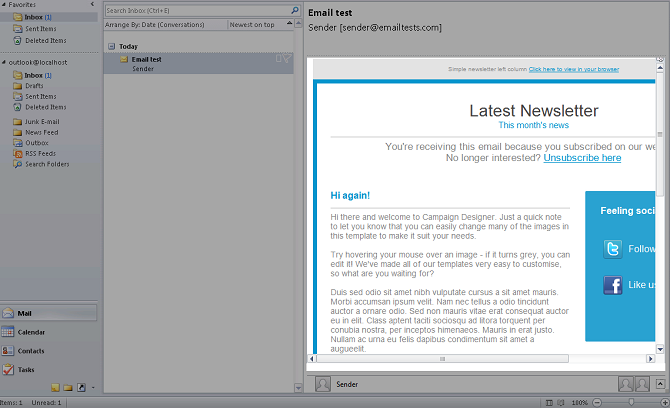 Showing the preview pane or the full email. This will help you decide which content should sit at the top of the email, where you're most likely to grab your subscriber's attention. Turning images on or off. This is particularly useful if you have an image-heavy campaign and to check that you've added alt text to each image. Within this window you can also flick between results, making it really easy to view the results from your Inbox Testing. This feature is automatically available for main account users. To add it for sub users check out our guide on setting sub user permissions.